I’m thrilled to introduce this sweet puppy, Dylan, who I loosely based on a Cavapoo/ Cockapoo puppy. He’s 10 inches tall sitting. He has wired front legs and tail. 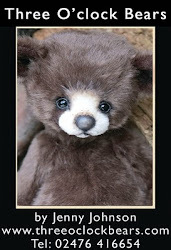 He is made from hand dyed curly mohair and contrasting ears. I gave him felt sculpted toes and a black sculpted resin nose.